Last year, we started growing a lot more (or, what seemed to me to be a lot more) lavender in one of the beds out at the farm. I wanted plants to sell and lavender to pick. I’d ordered lavender plugs (baby plants) from wholesalers, but again, I didn’t know how popular they’d be or how they’d do. And frankly, we ended up selling a whole lot of lavender plants and had a few of each sort in the bed come summer and the light bulb went off in my head at the beginning of August: I’d better start thinking about 2018: if I didn’t want to have to order more plants, I’d better take cuttings right then. Which is what I did. Now, I couldn’t just hack up the plants because the mother plants might not survive without some twigs and leaves of their own, but I managed to get about 25 cuttings of Lavender Provence, which I dipped in rooting hormone and stuck into a big tub of a mix of vermiculite and perlite(tm) and stuck in the shade under a tree (very high tech method and as long as you keep an eye on the rain and how moist the tub is, almost foolproof). And they sat happily in the shade for the rest of the summer and into the fall. Now, once you get into the fall, I had a choice: leave them out under the tree (which is something I’ve done with cuttings from evergreens and as long as we get enough snow and it stays cold enough for them to stay under snow, it works well) until spring and pot them up then, OR stick them in the unheated greenhouse we have at the back of our house and pot them up when the sun starts hitting the greenhouse in January. Which is (since you are seeing these photos right now) exactly what I did. With an unheated greenhouse, it’s not warm enough for the cuttings to grow a LOT, but they are growing a little bit and as things get warmer, they will grow a good deal more and they will branch out and I will nip the growing ends a bit here and there and they will make very nice little plants to put on the sales table come the end of April. My only job at this point, is to keep them reasonably moist (but not wet, more on that in a second) and they will pretty much care for themselves until I get a couple of moments to transplant them into four inch pots. So, I dug up one of the cuttings and as you can see, the amount of roots at the end of that cutting is basically the same length as the cutting itself. Pretty impressive considering that it has not been doing much of anything since October. And all I’ve had to do is keep it just moist enough (seriously, I think I spray that tub once a week on a sunny day) so that the plants don’t dry out. 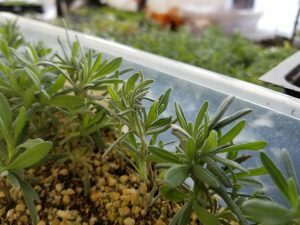 The enemy of things in an unheated greenhouse at this time of the year, to be blunt are too much moisture and cold temperatures. Under standard winter conditions (like, 20 degrees outside during the day), the inside can be in the 50s with sun, 40s without sun. 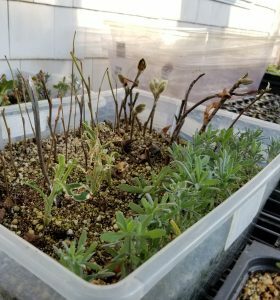 If it’s really cold, like 0 or colder, it can get down to the 20s in the greenhouse and frankly, when it threatens that, I stick a little electric heater or an oil filled radiator out there and that brings it up to the 40s and the plants are safe. But if it stays cold – like in the 40s AND I keep watering things, mold would just take off and kill everything. So, I am a big skinflint about watering at this time of the year. It gets a little bit crazy once things start to warm up because we can have huge swings during the day in February – like if it’s cold at night, we can have have temperatures at 0 and below and during the day, if it’s sunny, it can get into the 70s in the greenhouse. I can water during the day, but it has to be early enough so that things can dry off before the temperature drops. Well, yes, in our case, because we now have the nursery, having plants to sell is definitely, as Martha Stewart would say, a ‘good thing’. But what about anyone else? Well, there are certain things that we might have in our gardens that we’d like more of and don’t want to toddle down to the nursery or the home and garden center to have to buy ore. 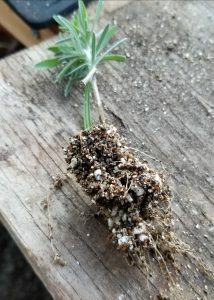 If the plant is a perennial (like lavender is), we can dig it up in the spring and cut it apart and have more plants but the one problem with that is that you are ending up with a bunch of plants that are all the same age, so they will all age and frankly start dying off at about the same time. It’s always good to take cuttings and grow new babies so that you can have plants that are a range of ages so that they don’t all kick off at the same time. So, right now, I have about 25 of this variety of lavender. And several will go into the bed and the rest will go into pots and onto the sales table. And the ones in the bed will get bigger and I’ll take cuttings from them this summer and start a new tub of cuttings this fall. ← And….we’re new and updated! !